Born in Missouri, Thomas Hart Benton was a leading figure in the Regionalist movement, in which some artists sought to counter the rise of abstract art by highlighting the American experience in rural or small towns. Regionalism, or American scene painting, would be disseminated throughout the country during the Great Depression through the creation of public murals and other works commissioned by the Works Progress Administration. 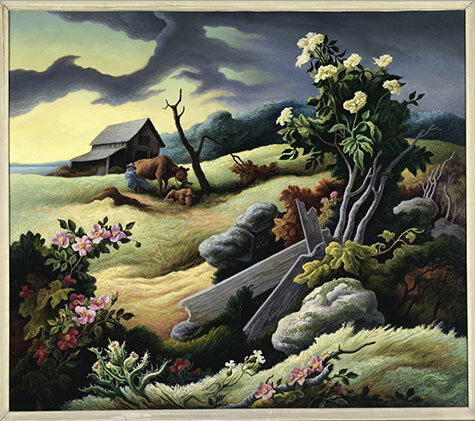 June Morning, painted after the end of the European conflict of World War II, represents Benton’s optimism about the strength of the American psyche. As the dark clouds part to reveal a clear sky, life returns to normal. New flowers and vines take over the broken fence, supplanting the dead tree in the middle of the composition. As Benton’s neighbor milks a cow, a calm Atlantic Ocean can be seen in the distance in this view from his mother’s property on Martha’s Vineyard.